Despite their best efforts, Barack Obama and regional Marxist thugs were not able to force Honduras to reinstate former Leftist President Mel Zelaya. In a quiet victory for a tiny democracy, U.S. buttinskies have stopped trying to restore a dictator to power in South America. Tiny Honduras is winning its fight for freedom. In a welcome about-face, the State Department told the Senate Foreign Relations Committee’s Richard Lugar, R-Ind., in a letter Tuesday that the U.S. would no longer threaten sanctions on Honduras for ousting its president, Mel Zelaya, last June 28. This marks a shift. The U.S. at first supported Zelaya, a man who had been elected democratically but didn’t govern that way. Now they’re reaching out to average Hondurans, the real democrats. Sure, the U.S. continues to condemn Zelaya’s ouster and still seeks mediation of the dispute through Costa Rican President Oscar Arias. But no U.S. sanctions means Hondurans have won. 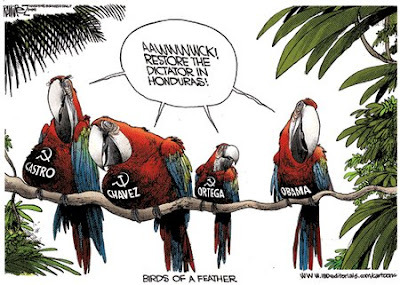 More… Obama got a little testy with his lefty friends over Honduras today.